POLK COUNTY, Fla. — A Christian student in Florida has obtained legal assistance after her humanities professor gave her four zeroes for refusing to conform to assignments that she believed to be anti-Christian indoctrination. Grace Lewis, 16, (pictured) is a dual-enrolled student enrolled in a virtual school from home. She has been taking college courses from Polk State College since last fall and has a 3.9 grade point average. However, Lewis recently was given four straight zeros in her humanities class by Professor Lance “L.J.” Russum for being unwilling to answer his assignments about Christianity in the way that he wanted—which she believed was antithetical to, and hostile to, the faith. Because Lewis’ essays were unsatisfactory to Russum in that she could not agree with the material she was being taught, she was given zeroes. She then contacted her professor to express concern out of her belief that her faith was being targeted. Lewis then contacted the Christian legal organization Liberty Counsel for assistance, which requested an investigation into Russum as well as an apology and an assurance that Christians will not be discriminated against in his class in the future. But Polk State University is reportedly continuing to defend Russum. An attorney for the university states that other academic officials reviewed Lewis’ work and agreed that she was wrong in not going along with what being asked for in the assignments and instead defended her Christian beliefs. Liberty Counsel, however, believes that it is rather the university that is wrong in punishing Lewis for not conforming to anti-Christian ideas. 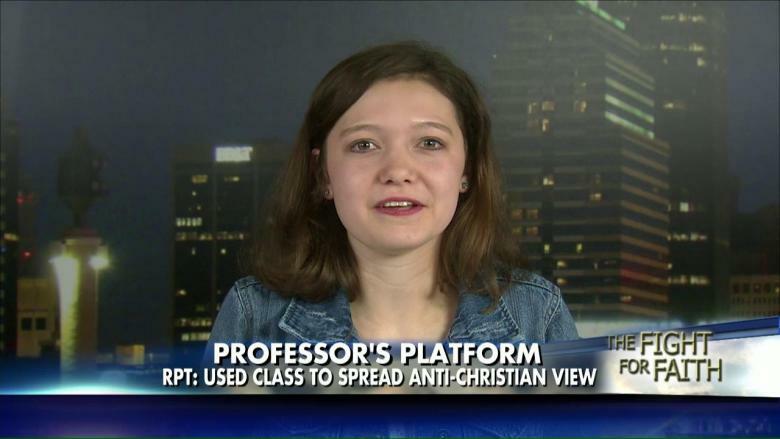 “She simply was being belittled because this person is a militant atheist intent on destroying her faith,” Staver told Fox & Friends on Thursday, adding that he believes Russum is “proselytizing militant atheism” in the classroom.